Plans to limit the number of fast food takeaways near schools in Luton have been approved by councillors. About 42% of the town's children in year six, aged 10 to 11, are "overweight or obese", according to the borough council. The authority now has the chance to control takeaway numbers when it reviews Luton's Food Plan this summer. The Royal College of Paediatrics and Child Health said the outlets should be banned from within 400m of schools. President Prof Russell Viner told the Daily Telegraph on Monday: "Kids are coming out of school hungry and finding themselves surrounded by cheap chicken shops, chip shops and other types of junk food." 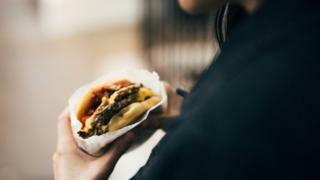 Labour-controlled Luton Borough Council said it wanted a policy in its local plan to restrict any increase in fast food outlets close to Luton's primary and secondary schools. The authority is also aiming to promote healthier school meals and fast food options, with reduced salt and sugar. Reality Check: Why ban fast food within 400m of schools?